Does the config.php contain correct https URL? Made any changes to the .htaccess file? Re: OC 2.0 Better than 1.5? OC 2.0 Better than 1.5? Re: How to add quantity option? You need to search the marketplace for yourself! How to add quantity option? How are you getting to "first page / home open first time" to begin with? Why waste time and money developing something that's already out there? Read through this similar post, there are some links that will help you find an extension to do what you require. Re: meta title cause issues help required. meta title cause issues help required. Are you using a custom SEO module/extension or made changes to your .htaccess file? Introducing Custom Field for Stock Control - An OCMOD extension for OC 2x-3x. Re: [SOLVED]Duplicate SKU for Stock Control Purposes? 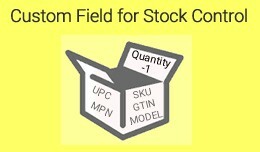 [SOLVED]Duplicate SKU for Stock Control Purposes? Works without error here on a clean install. Not made any changes to the file? Can you post the first few lines of "catalog/controller/extension/feed/google_base.php"? The developer has been around for a while and offers good support and other similar modules.